Reorder Analysis is a tool in Order Time that analyzes data and determines what needs to be purchased. It allows you to identify the items that need to be purchased at a particular time, based on certain business rules, filtering and methodologies. Depending on your business requirements, running a Reorder Analysis can be periodically or everyday. Reorder Analysis can be accessed from the Purchasing tab. Follow the steps below to create and run a Reorder Analysis. Click the Reorder Analysis link. Fill out the form in Demand Options tab. Name - Assign a name to your Reorder Analysis. Time Horizon - This allows you to project out a certain time range in months or weeks. Choose either Month or Week from the Select Interval pick list, then enter a value in the Number of periods field. Historical Data Basis - With the given value that you provided for the Time Horizon, this enables you to set up the basis for the historical data that you want to extract. Rolling - If you select this, it means you want the system to give you an analysis immediately before the predetermined value given in the Time Horizon. Comparative - It prompts the system to analyze data from the same time (i.e. value in Time Horizon) last year. Specific Locations - Select specific locations. Un-checking this means you are selecting all location. Lead Time - This is a time span that measures the time it takes a supplier to deliver stock to your door. For example, if you placed a purchase order with your supplier on December 1 and received it December 15, the lead time is 14 days. Note: This includes weekends. This sections is asking you what kind of Lead Time you want to use. Item Lead Time - This references the value that you entered in Items > Vendors tab > Lead Time. Most Recent - This is the most recent purchase order for a specific item. Average - This the average quantity over the Time Horizon specified when setting up the scenario. Enter a value in the Default field. This is a required field. The value entered in this field will be used by the system just in case you do not know what lead time to use or the system cannot find the lead time or there is no data to use as basis. 4. Click the Item Filters tab and set your filters by selecting items to flag by. Filtering is a practical way to see only the data that you want displayed. The main filter is Show items when 'Evaluation Quantity' is. Evaluation Quantity is what you have available today (Item > Available inventory) plus what you have on Purchase Order (Item > On order). Any Amount - This means that you want the system to show you all items in every amount. Below the Reorder point - This references the reorder point specified on the Item > Purchasing tab > Reorder Point field . The reorder point (ROP) is the level of inventory which triggers an action to replenish that particular item. It is a minimum amount of an item which a firm holds in stock, such that, when stock falls to this amount, the item must be reordered. 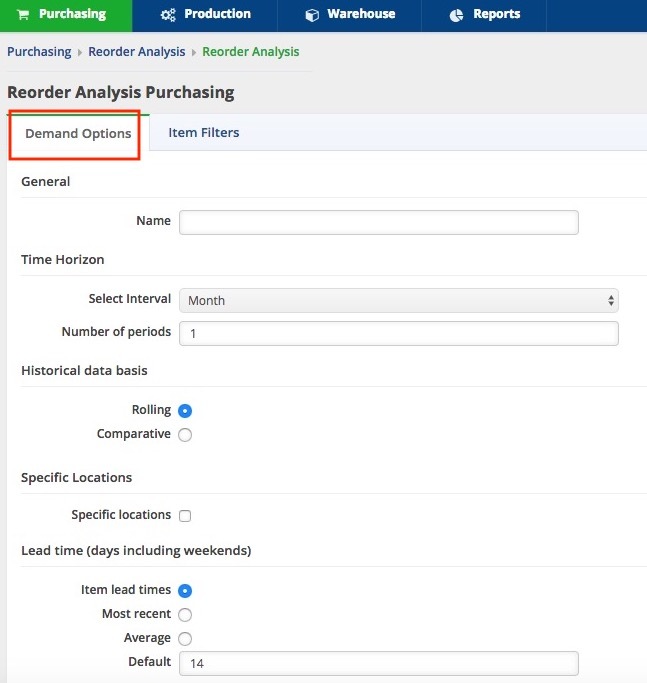 Has demand (Required) - The 'Required' amount is the total number of the item on open Sales Orders plus unallocated components on Work Orders that are in 'waiting' or 'ready' status. Not enough to satisfy demand (Deficiency) - This means that the quantity in stock is lower than the quantity specified in the Sales Order. Class - This references the Class specified on the: Item > General tab > Class field. Group - This references the Group specified on the: Item > Group. Vendors - This references the Vendor specified on the: Item > Inventory tab > Vendor column. 5. Click Save. Once saved, the Reorder Analysis runs. You do not have to re-create your Reorder Analysis every time, all you have to do is Re-Run it to get freash results.